Hmmm, this week is a bit of a tough one, because most of what I am working on is secret. I can show you a teaser picture. But I'm afraid that is all, until next week. I am, however, about to cast on with these beauties. These yarns are, from the top, moving clockwise; Posh Yarn Martha Sock in the Dreams of An Insomniac colourway, The Uncommon Thread Lush Twist in the Pontus colourway and Countess Ablaze Count Cashmerino in the Grey Skies over Manchester colourway. 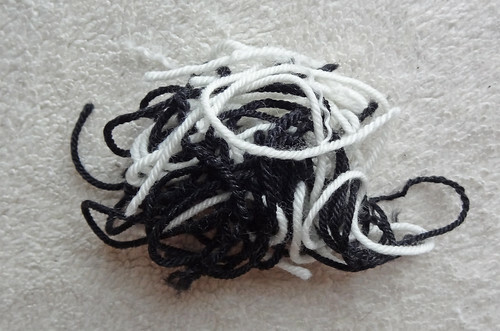 These yarns are all 80% merino, 10% cashmere and 10% nylon. The bottom two have almost the exact same twist and appearance, so I think they may be the same base yarn. 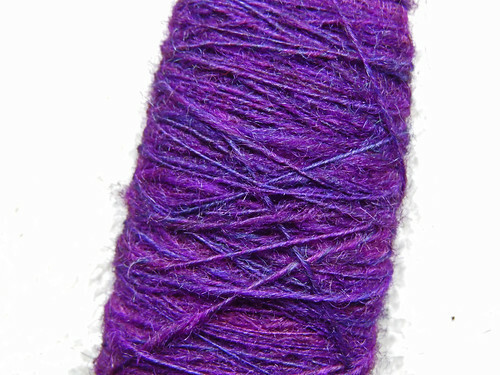 The top skein is much more loosely plied and is therefore a bit more squishy. 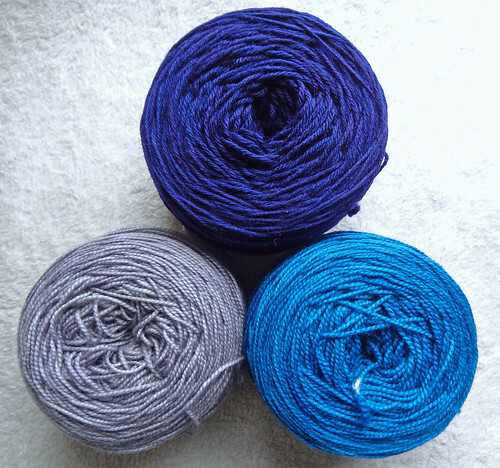 I intend to use these skeins to make a big garter stitch stripy shawl (because we all know how much I like those). I'll use the bottom two to stripe the main body of the shawl and the top one to knit on a border. I'm so excited about this shawl because I know it will drape beautifully and feel gorgeous on my skin. It's a really decadent knit, and a proper treat to myself after doing all my secret knitting. 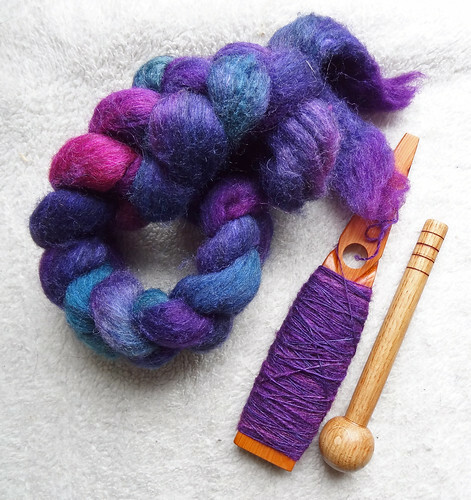 In spinning news I am now plying up the gorgeous singles from the Superwash BFL fibre from The Yarn Yard. I'm using my cardboard box lazy kate. It works pretty well! This is going to be such pretty yarn. I've plied this yarn much more loosely than last time, so hopefully it will have a better yardage. 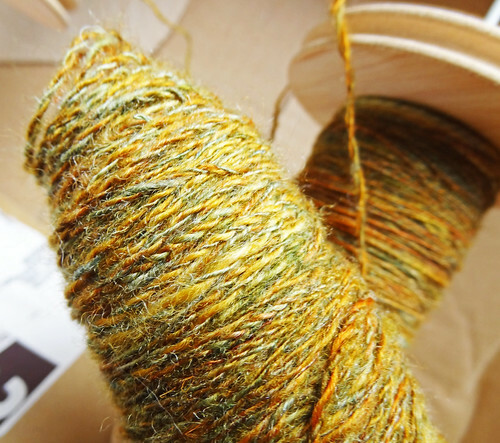 The depth of the colour from this fibre is stunning. 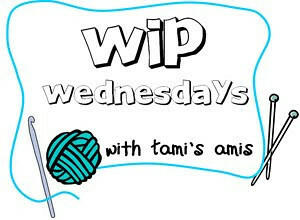 I am really itching to knit with it, but I've got to finish plying it first. 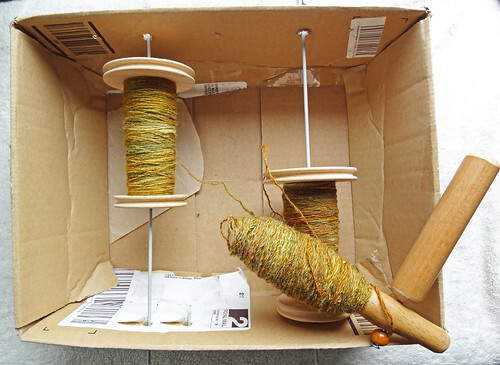 Whilst I am plying, I have also started to spin up the BFL Silk from Picperfic. Oh, my goodness that stuff is pure heaven. It spins like a dream and the colour is amazing. I'm getting the hang of the Rakestraw spinner but I would love to find a good source of information about using it properly. I'm half inclined to get Respect The Spindle by Abby Franquemont because I've heard it is the best resource for learning to use a spindle. I know it's a different tool, but I think a lot of the techniques could be the same. I don't know, does anyone have any ideas or can you suggest a resource for me, because at the moment I feel like I'm working in the dark. I'm enjoying the process but I know there is more I should be doing or learning about. I'm afraid that is all I can show you this week, but hopefully you will forgive the secrecy when you see what I have been making, next week.